This project called for Hoist & Winch to supply 3 Off “Special” scaffold structure mounted profiled track monorail lifting beam systems with the following lifting capacities a) 1 Off 1000 kg Swl and b) 2 Off 2000 kg Swl and each fitted with an electric hoist, and to be used in the refurbishment of a 5 storey building located in central London. After consultation with our customer (a large Scaffolding Contractor) Hoist & Winch was contracted to supply the equipment as specified below for installation by the customers own installation team but with final inspection, overall equipment commissioning, load testing & certification by Hoist & Winch. Cantilevered Design Profile Track/Scaffold Structure design to allow the hoist unit hook coverage to reach past the edge of the building and to allow offloading/lifting operations from delivery vehicles parked in the roadway below. This was the longest and largest capacity scaffold structure mounted profiled track monorail lifting beam system that our customer has purchased/installed to date. In view of this, we worked very closely with our customers Consultant Engineer, who was present during the load testing procedures for the roof top mounted systems. Due to local traffic access and pedestrian walkways, the commissioning and load test of the equipment was very demanding, and extensive planning and site surveys were required. All works carried out were closely monitored due to the safety critical nature of the installation work, which called for very careful planning of all work activities and detailed documented Risk Assessments and Method Statements. These were reviewed and approved by the Site Project Manager before work could commence. 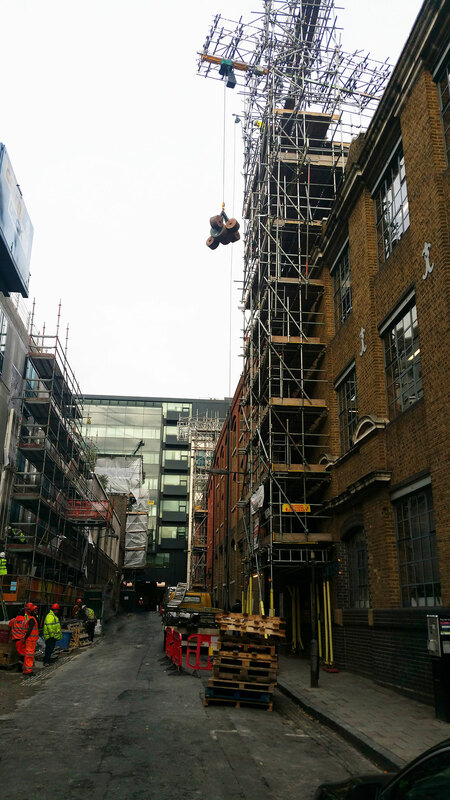 On completion, Hoist & Winch Ltd issued a LOLER Thorough Examination Report for the completed scaffold support structure, electric powered chain hoist and profiled track installation work. From order placement to completion of all work, the timescale was 6 weeks. Our customer was extremely satisfied with the successful work completion and based on this, Hoist & Winch Limited have secured an inspection/maintenance contract with the customer to attend site twice a year, in order to ensure continued trouble free operation.